My stay in Slovenia was short and sweet: I was only there for three days, and yet it managed to elbow its way (elegantly) into my favourite short-haul country. I also ate some really, really good cake - which wedged its way firmly into my heart. Between Ljubljana & Bled, here are a few of my many favourite things about Slovenia to inspire first-timers. 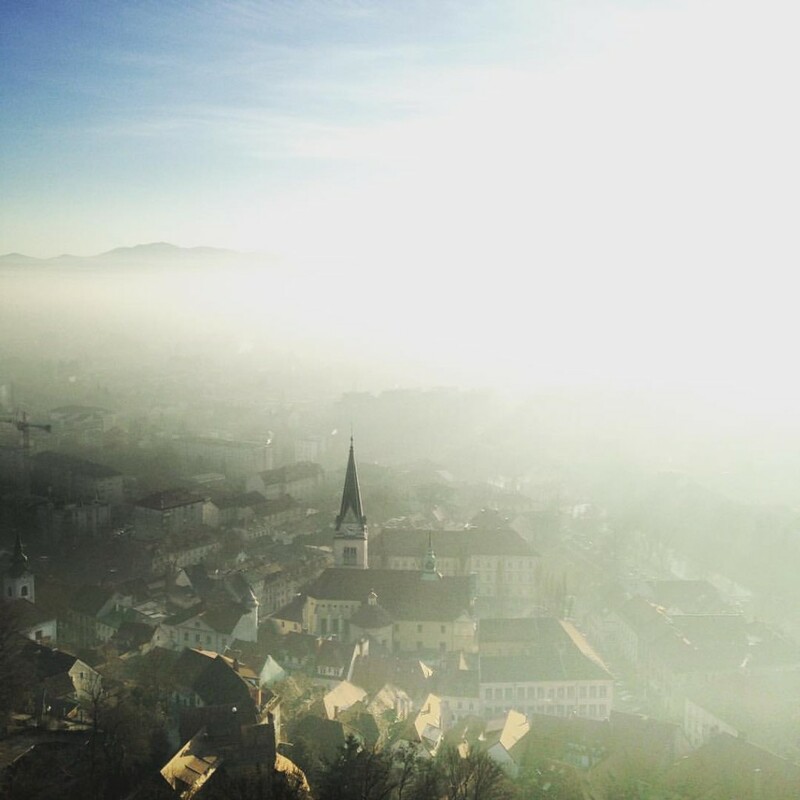 Despite the sub-zero temperatures in late December – the capital of cosy is now L For Ljubljana. Even the challenging consonant-laden name has a warm, fuzzy feeling to it somehow. In the period between Christmas and New Year, the relaxed lull began to grow in energy; merry markets, mulled-everything and communal cheer mounted as Slovenians and visitors got charged up for the big celebrations. All activity in the city clung to the green river: during the day, bright sunshine brought coffee-drinkers outdoors to chat idly with friends along a maze of cobbled streets, lined with delicate medieval facades. 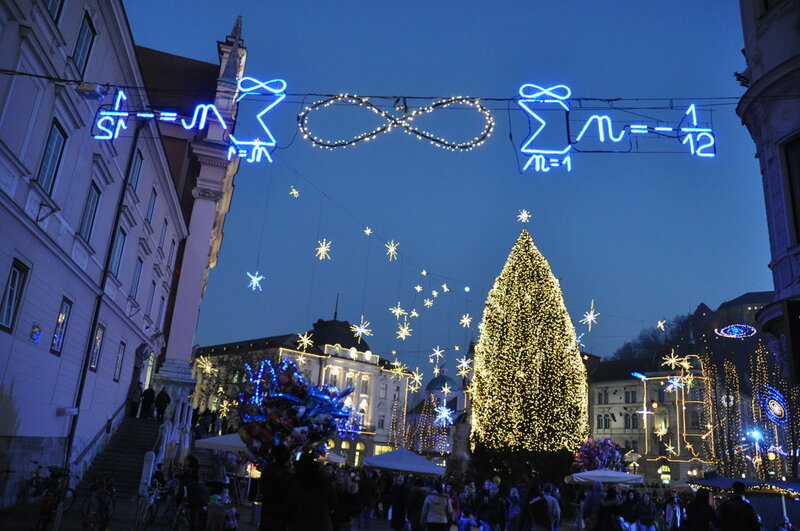 As darkness closed in, the moon and stars were accompanied by Ljubljana’s themed festive light show of scientific equations, constellations and glowing planets. The castle loomed overhead - luminously emitting its own tranquil halo of light. The city was festooned with happy beery laughter, the projected promises of glass clinkers. A layer of mist lay like a frosted blanket over steepled churches and toy terracotta rooftops. I was curious about Slovenia’s cross-section between Mediterranean and Eastern European flavours, but I hadn’t heard positive reports about their range of vegetarian options. Though most of their traditional dishes seem to centre on meat (including distinctive sausages, stews, gamey ravioli and marinated fish courtesy of the country’s coastal stretch), Slovenia had a few surprises up its sleeves. My first port of call in every new place is the supermarket. On the suburban outskirts of Ljubljana, we found a delicious array of pickles, vegetable tapenades, and tofu drenched in different marinades, fresh crusty bread and local Bovec cheese made with sheep’s milk. And then we visited one of the restaurants. A cosy, dark restaurant right next to the castle funicular, the expectation was of a loud tourist bubble, but the reality was friendly service, a creamy and light roasted garlic soup starter, and a bread bowl of porcini mushroom buckwheat porridge. This food was so good, I still think about it three months later, and dribble a bit. A day trip to Lake Bled was always going to be the icing on the cream cake – which the region is famous for. It was made all the more interesting by our likeable local tour guide who shared the intricacies of Slovenian culture and history, showed us the wonders of the alpine landscape and stopped at all the right spots for inevitable tourist ogling and Instagram money-shots; which the lake and backdrop of mountains, like a fairy-tale frozen in time, deserved. 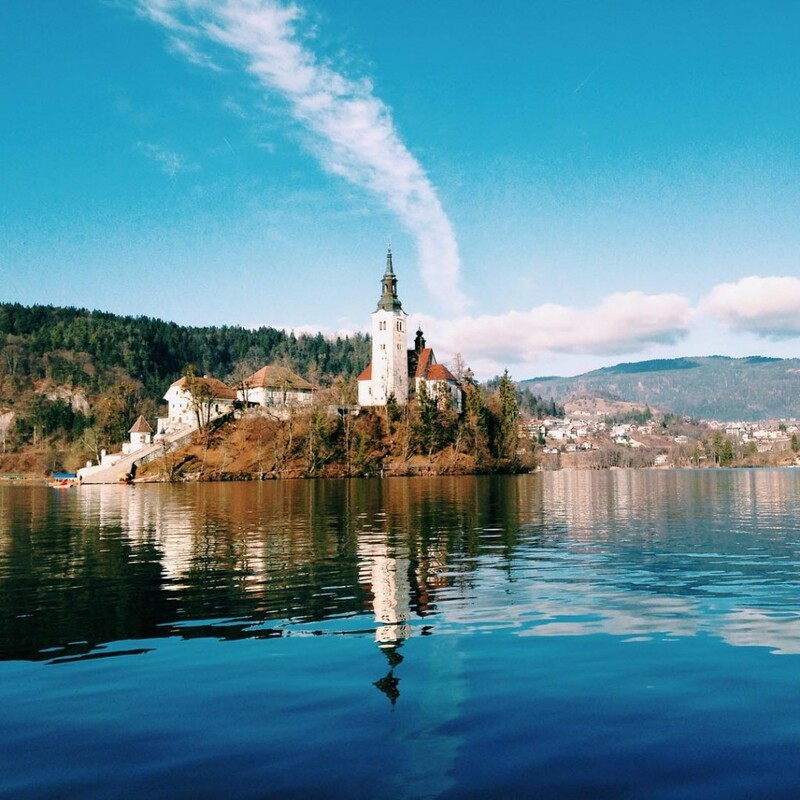 A visit to Bled castle, a slab of feather-light, fluffy cream cake, a nosy tramp around an abandoned building, and a rowing boat across the mirrored lake, all made for a mini storybook exploration which I only wanted to continue. Especially when the guide described the longer tours Slovenia Explorer runs, which involve surprises at the whim of the guides, who divert to festivals, towns, mountains, hidden coastlines and more, depending on the season, and the crowd. I was coerced by a waiter into burning my insides with a shot of šnops (super strong fruit brandy) at a fairly benign restaurant on the second of my three nights in Ljubljana. Already slurring, I joined two friends at a bar called Daktari. Filled with grandma’s old furniture, rickety bookshelves, obscure art and ancient, opulent carpets and chandeliers, Daktari was poky, smoky - with a cramped, closed off area to light up near the bar - and a lot of fun. Working through a list of craft beers, they became more delicious in succession until we left at 3am, when the buzz had only just quietened on a Tuesday night. On my last night came Metelkova, the main event: not much for clubs, this was one I’d heard whisperings about before, so I was excited to be taken by a Slovenian friend who loved the place. 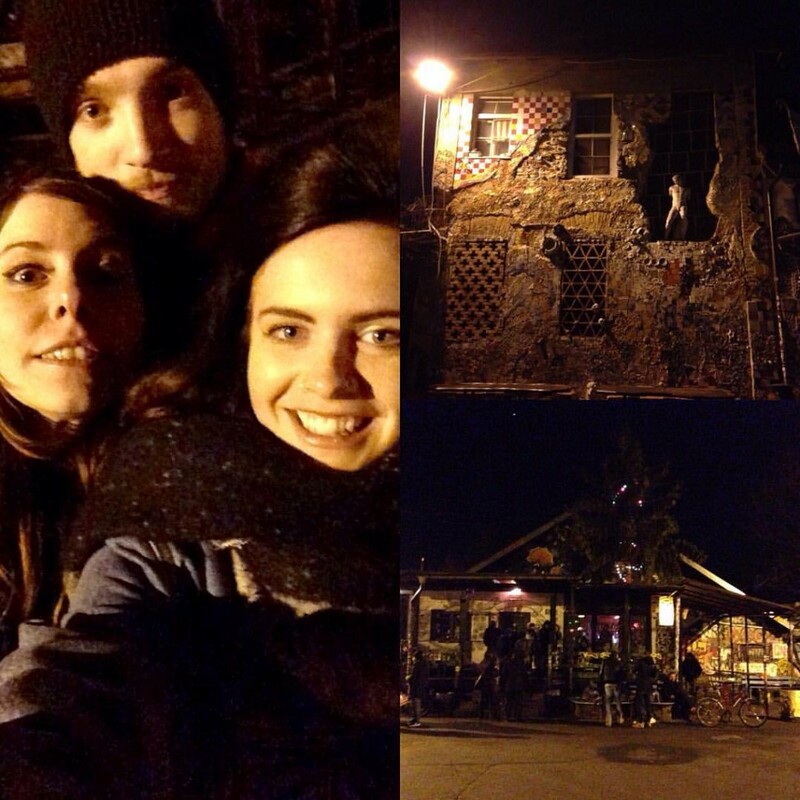 An abandoned army base, Metelkova sits somewhere on the spectrum between urban squat and underground cultural complex. It was quiet when we arrived (the day before NYE), but the network of galleries, art installations and a club for every music scene was like nothing I’d seen before. A smattering of students and artists were still revelling in the streets and bars, surrounded by broken bike-frame sculptures, upturned oil drums and walls of whimsical and extraordinary street art. When Slovenia gained independence in 1991, local artists and activists lobbied for the space to be rescued from the grasp of commercial real estate. With their only option to occupy it themselves, the area became an autonomous zone – with the authorities tolerating it despite their disapproval. For me, establishing this space of acceptance where diversity is celebrated embodies why Slovenia is so seriously cool: a gathering of cultures which is greater than the sum of its parts, and extends far beyond its pretty chocolate box appearance. 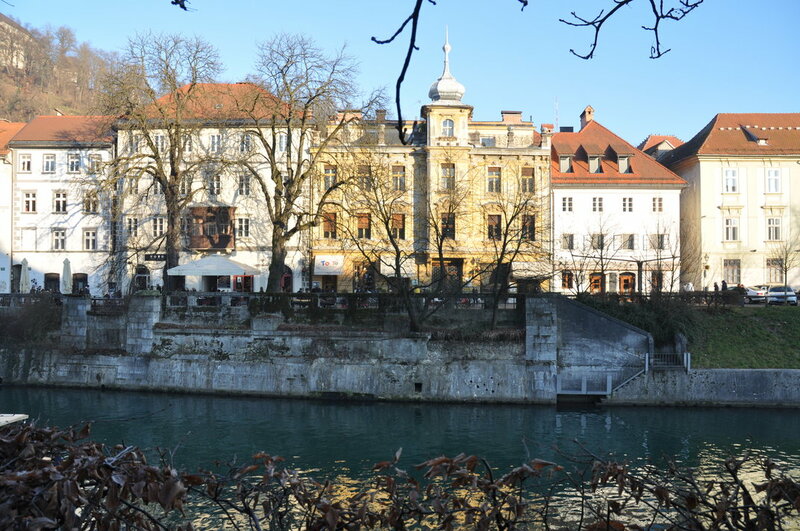 Tagged castle, culture, daytrip, food, lake, Ljubljana, river, spirits. Bookmark the permalink.